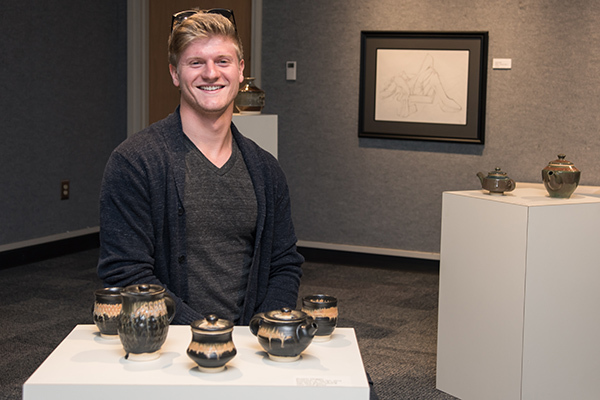 Art education major Dustin Hogan exhibits three pieces of his work at the Roy C. Moore Art Gallery at UNG Gainesville. 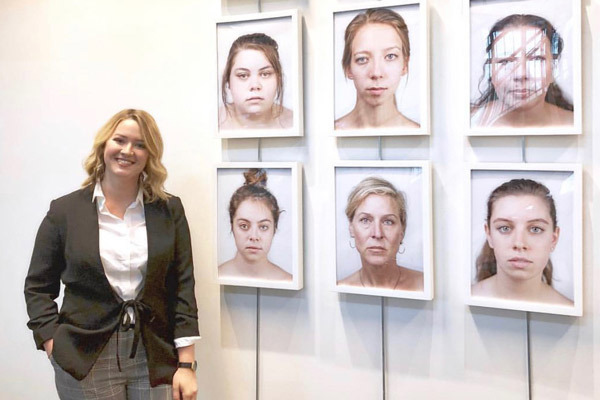 The Department of Visual Arts at the University of North Georgia (UNG) recently presented student art exhibits on the Dahlonega, Gainesville and Oconee campuses. Each year, a panel of visual arts faculty members from each of the individual campuses choose students to present their work. Students also receive scholarships that will be put toward tuition or further work to be showcased in their senior shows. 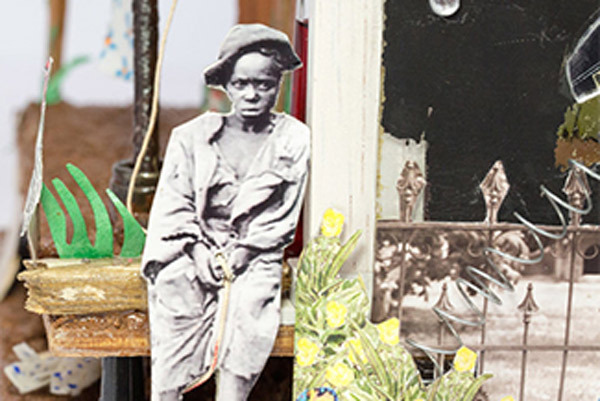 John Amoss, associate professor of visual arts, worked with many of the students for months on their exhibitions. "I feel that the purpose of this capstone class is not simply for students to apply all that they have learned, but it also serves as a transition from academia to the greater world. They have spent four years learning their craft, but they are also exposed to other resources that the institution has to offer, including financial planning, self-promotion and vocational skill building- know-how that will serve them to achieve their long-term goals," Amoss said. The students on the Gainesville Campus were Aleta Reid, Lauren Bradshaw, Cayla Hall, Eric Cortez, Young Lee, and Dustin Hogen. Their work was featured in the Roy C. Moore Art Gallery April 17-26. April 17-27 on the Oconee Campus, the art students displaying their work are Kyra Marshall, Lindsey Blankenship, Roberta Johnson, Megan Carter, Rowan Bird, and Natalie Briscoe. On the Dahlonega Campus, there were two gallery exhibits on display from April 3-27. One featured the Senior Exhibition Series – two groups of graduating seniors presenting their senior thesis materials. The other, the Hal B. Rhodes lll Student Exhibition, showcased the top-voted artists majoring in studio art, art marketing, graphic design, digital arts and art education. 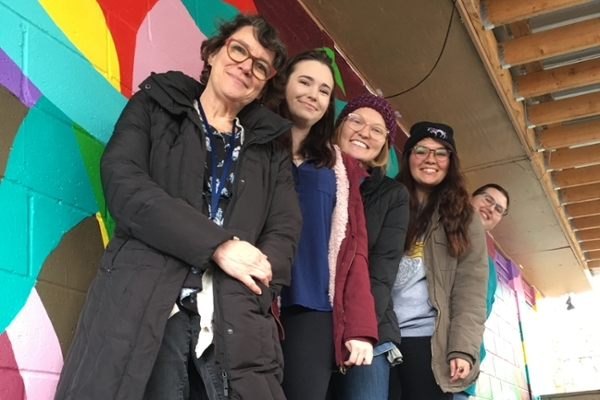 Jennifer Graff, associate department head of visual arts, has been with the university for 12 years, and in that time has found that the most rewarding thing to see with these students is their development as people and artists. "For many students, this is their first time putting an exhibit together. This process prepares them for the professional experience that they will eventually have outside of the university," Graff said.